Rather than just adding an algae preventative when you close your pool, add another dose in the middle of the winter if possible. These products help keep algae from growing in your pool during the off season and make opening it again during the nice weather much easier. During the winter go through your shed or pool house and dispose of any chemicals you used during the year. It is never a good idea to keep these chemicals for more than a year as they can become damaging to your pool once expired. Likewise, use this opportunity to get rid of any pool accessories that are broken or too dirty. While in an ideal world it would be nice to close your pool, cover it, and forget about it until the summer. But it’s important to ensure you keep your pool cover clean all winter as part of your winter pool maintenance routine. Over the course of an entire winter a lot of heavy debris and snow can collect on the cover. It’s best to avoid letting it get so weighed down that it becomes hazardous. Additionally, by cleaning frequently throughout the winter you will avoid a massive and time consuming clean up in the spring when you are itching to cool off in the pool. At the very end of winter try and find time to trim your bushes and trees surrounding the pool. It is easy to do this while the pool is still covered, because you don’t have to worry about any of the clippings getting in the water. Clipping trees and bushes before you remove your pool’s cover means yard maintenance around it will be complete for the summer and it’ll create a beautiful backdrop for your swims. When winter is finally over and it is time to open your pool again, don’t get too ahead of yourself. Before removing the pool cover it is important to make sure you remove any excess water that has collected on the cover and let it dry completely before storing it again for the next year. 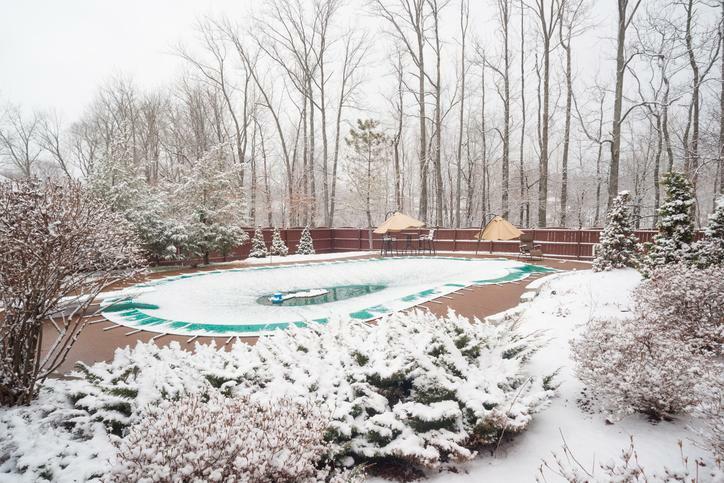 Overall, winter is an opportunity for you to get a break from all the work involved in maintaining your pool but it is important not to overlook these simple winter pool maintenance tasks. Contact Total Pro Pools, if you need professional pool closing services for the winter. We’ll ensure your pool is taken care of so you when the temperature gets hot you’ll be ready to jump in for a swim! © Copyright 2016, Total Pro Pools, All Rights Reserved.